Everyone loves a quality portable Bluetooth speaker, be it for house parties, traveling, listening to music in the shower, or more. But before you go out and buy the first one in your sight, you need to know that they significantly vary in quality, design, and efficiency. You need to consider the build, sound quality, portability, durability, and much more before selecting any one. We know just how daunting it can be and that is why we have brought to you an expert comparison between two trending Bluetooth speakers. JBL Clip 2 and Sony XB 10 have become cult favorites with a wide and extensive fan base. So, here is an in-depth review and comparison to help you make the right choice. Apart from the fact that both speakers have their speaker grill situated on the top, they are quite different in design. The JBL Clip 2 has a slim, circular, drum-like design. It has a carabiner on its top so that you can easily hang the device anywhere you want. With a metal body, the carabiner is strong and sturdy, and extremely portable. The design and shape of the speaker are easily transportable and can be easily stored in your bag, pocket, or such. The Sony XB 10 looks more like a short, fat soda can. The best thing about its build and design is that you can easily store in on any drink holder slot in your car, bags, sofa, or anywhere else. The speaker contains a detachable strap with a plastic ring at the end that can be availed to hang the speaker to any attachment. The plastic ring available with the strap can easily be used as a stand to direct the sound in your desired direction. While both speakers are smartly designed and are quite portable, the JBL Clip 2, with its slim body and compact design, is much more versatile and efficient. Both JBL Clip 2 and Sony XB 10 have a soft, matt, rubberized plastic body. While JBL has customized its design to resist dust and lint, Sony has not. The soft body of Sony XB 10 attracts a lot of dust and lint which is a bit difficult to clean. Both JBL Clip 2 and Sony XB 10 have water protection but it is the level of protection that differs. JBL offers a complete and extreme waterproof body that can easily be submerged into 1- meter deep water. You can easily keep the speaker underwater for about 30 minutes without damaging it. It is perfect for pool parties and you do not have to worry about dropping it into the water. When it comes to Sony XB 10, it does provide water protection, but you cannot submerge it in the water. The speaker only offers splash-protection and therefore, will not survive a swimming session in your pool. However, you can use it as your shower speaker or even lightly wash it to clean the surface. Both the speakers have a waterproof door that covers and protects the port. For JBL Clip 2, the door is extremely tight, and the port lies deep in the device, which can be a bit problematic when you need to connect the charging cable. But for the extreme waterproofing capabilities it offers, the inconvenience is necessary. Since Sony cannot be submerged and is only splash-proof, the door is extremely easy to open and close for connecting the cable and charging your device. The Bluetooth range for both JBL and Sony are quite good. Within a range of 20 feet, the speakers provide exemplary connectivity. Yes, some other speakers do offer more range, but 20 feet is more than average and generally, you will not need more. The speakers can also be connected via a cable. The JBL Clip 2 offers a 3.5mm built-in audio cable that has been threaded along the speaker while Sony XB 10 has an audio jack input port. The built-in cable provided by JBL is quite convenient as you do not have to carry a cable around with you. But then again if it gets damaged, there is no replacing them. With Sony, you do have to carry a cable around, but it is also easily replicable. When it comes to the battery life of the speakers, both speakers are considerably great. The battery life does depend on the volume of the music you play; the higher the volume, the faster your battery will die. On full volume, the JBL Clip 2 gives about 3 hours 40 minutes while the Sony XB 10 offers 6 hours 30 minutes. So, Sony XB 10 wins this round as it has a much more enhanced battery life than the JBL one. The sound quality of both the speakers is quite different. JBL Clip 2 provides much better and clearer highs and mids but the bass has significantly suffered. The bass is quite weak, and you might face some rattling during transitions. The highs are much livelier and dramatic which can be a plus point for people who love such notes. Its overall performance is enjoyable on different types of music. When it comes to Sony XB 10, the bass is extremely powerful and accurate. But it struggles when it comes to high notes and certain complicated acoustics and tracks. The mids are quite muddy and can seem extremely lifeless and dull at times. We also found some inaccuracy and distortions on full volume. Sony XB might be good for bass-lovers but JBL Clip 2 is better if you want accurate and clear sound. PROS: Extremely portable / fully waterproof (can stay underwater) / clearer and more accurate sound. PROS: Better battery life / powerful bass / replaceable cable. CONS: Irreplaceable cable / average battery life / weak bass. CONS: Cannot be submerged underwater / unclear and distorted high notes / attracts dust and lint. 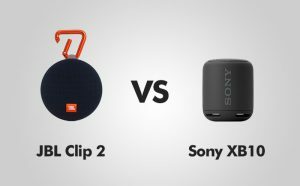 Both JBL Clip 2 and Sony XB 10 are quite good in quality, portability, and durability. If you want something that has more battery life, has a powerful bass, and is quite compact, go for Sony XB 10. But if you want a fully waterproof speaker that provides excellent clarity and accuracy, try out JBL Clip 2.